The 55-inch EA9800 is LG's answer to the up and coming OLED HD display technology in TVs. The display is 1080p resolution, as opposed to Sony's new 4K TV resolution (essentially 4 times the resolution or 1080p). 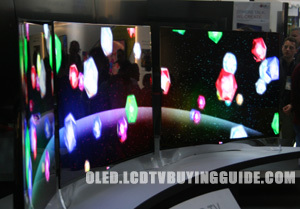 But OLED has many advantages over 4K TVs such as perfect side angle viewing quality and better black levels. Fortunately, we've already had a private screening of the TV for this review although we could not implement calibration equipment. This is one of the first OLED TVs of this size to be mass produced for the public, along with its only competition this year coming from Samsung. The main difference between the two TVs is the design of the OLED technology placed in the display. The EA9800 uses the WRGB system, where white OLEDs are used with red, green, and blue sub-pixels to produce the image. Samsung's RGB display format uses three independently colored OLEDs to reproduce the image. The 55EA9800 colors may not be as vibrant, but they are much brighter and able to provide better color accuracy. So what's with the concave curved screen? Think back to the tube TV and you will remember a slight curvature in the screen as well but it was convex not concave. LG's reasons for the slightly concave curved screen are 1) design appeal, it's a change and that's a reason in and of itself it seems and 2) IMAX uses a slight concave design to generate its picture quality and LG believes that science behind the curve enhances viewing picture quality somewhat. Picture quality is the first thing to address when it comes to OLED TVs. 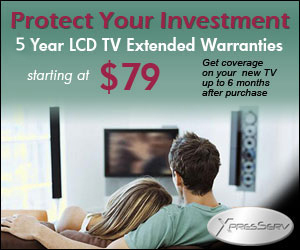 This new display technology surpasses all available LCDs and plasmas without a hitch. OLED TV technology is just that good. It's the best we've ever seen except for the prototype 4K TVs introduced this year. First of all, there is no back light in the EA9800. OLEDs produce their own light. That means black levels are top notch in this TV. The EA9800's picture is not affected by viewing angle or ambient brightness either. Contrast and color deterioration are basically non-existent due to the RGBW display LG uses in this set. The problem of motion judder is addressed in this OLED TV as well. The EA9800 has a 120Hz refresh rate that does a great job of smoothing out any fast motion. A huge plus for sports programming. Contrast ratio is measurement of the brightest whites and the blackest blacks a display can offer. The number can sometimes be kind of outrageous while making little to no difference on the actual effectiveness of the panel. This OLED does away with the numbers by offering an infinite contrast ratio. This means optimal contrast will be delivered no matter what the ambient brightness level or viewing angle happens to be. As if the almost perfect picture quality does not create a desire in you to posses this TV, LG has loaded the EA9800 with all of its top-tier features to make it irresistible. The TV is 3D ready with LG's Cinema 3D technology. This is passive 3D, which means glasses will be much less expensive and there is no need to worry about keeping glasses charged. LG's Smart TV is included and adds a lot of functionality to the TV that is well worth it, but we hope the memory and speed is better than LG's current offerings in Smart TV. The Smart TV includes a dashboard with many standard and premium apps as well as a full web browser. LG's included magic remote improves the overall user experience of the Smart TV suite by implementing a point and click operation. This mainly applies to web browsing and app selection, but makes most menus a little easier navigate and more fun to use. This version of the magic remote has four different modes and a built-in mic. 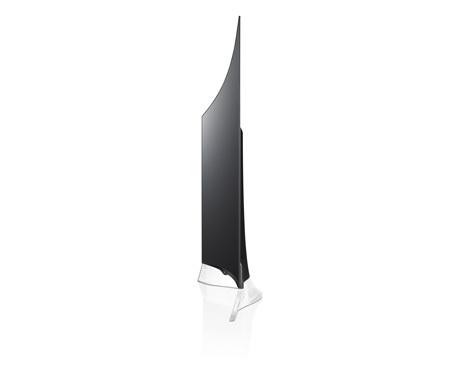 The appearance of the EA9800 is just about as impressive as the picture quality with its avaunt-garde slight curvature. With a depth of only .17 inches it is one of the thinnest TVs on the market. Because the EA9800 is so thin, the TV's stand is where all of the media connectivity happens. The stand then connects to the screen with a proprietary cable. The TV is lightweight clocking in at only 38 pounds. Carbon fiber reinforced plastics allow the EA9800 to be light but not terribly fragile. The bezel around the display is a mere 1mm thick, making the picture the center of attention when the TV is on. The clear acrylic stand is also very attractive. This TVs design is as much art as it is functional, so to show it off properly requires using the table top stand. LG has produced some of the best speakers and sound quality this year in its TVs. The speakers for the 55EA9800 are actually located in the stand and have a thin transparent face. OK, hold on to your seat, suggested retail for the 55EA9800 is $14,999. So that means it will likely sell for our projected prices of around $12,999 or possibly even $11,999. Let's compare that with Sony's excellent 4K TV XBR-55X900A at $4,999 or you could spring for the 65 inch version XBR-65X900A at $6,999 (the best selling size). There are benefits to each of these TVs that have to do with the differing technologies, but for comparison I think it's fair to say the LG is a bit out of the pricing ballpark here. Consider also the top of the line LED Samsung UN55F8000 at $2,499 and you have to ask if the 20% better picture quality in the OLED is worth the difference. Don't misunderstand, we think OLED is the best picture quality technology and we rated the Sony 4K OLED TV the best picture quality of any TV at the CES show. We love OLED and those with plenty of money and to squander will get a piece of art and a functional TV with the best quality black levels at the same time, but man what a premium to the other options.